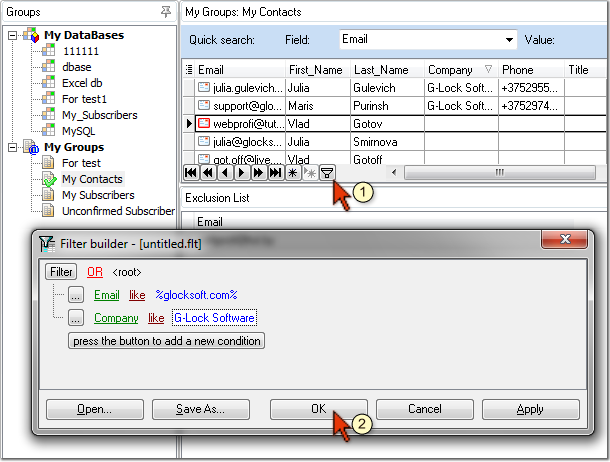 G-Lock EasyMail includes an easy-to-control Address Book where you can create database connections and internal groups. When you need to send an email to your subscribers, just select the desired group name in the To field instead of entering each contact individually. You can create as many groups and import as many subscribers as you want. You don't have to limit yourself in email marketing! Plus, G-Lock EasyMail Address Book provides you with numerous fields to store contact information: email addresses, home and work addresses, phone and fax numbers, conferencing information, instant messaging addresses, personal information such as birthdays or anniversaries and much more. And you can use powerful search, filter and sorting capabilities in the Address Book to organize the records in the most convenient way for you.